Teral-Aerotech manufactured tube axial fans with different model belt driven, direct driven with spark resistant aluminum casted impeller. Teral-Aerotech tube axial are designed for moderate pressure ventilation and industrial process application. Teral-Aerotech tube axial flow fans are specially designed and manufactured for optimum relation between air quantity and power consumption and to meet the exact demand of commercial and industrial ventilation in hot, humid, dusty and corrosive environments. 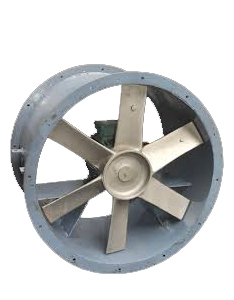 Cylindrical casing of fans is fabricated out of mild steel /stainless steel sheet with adequate size of fine clearances as is practicable for better efficiency. Impeller will be of cast aluminum alloy and airfoil blade is designed to have maximum efficiency at low power.